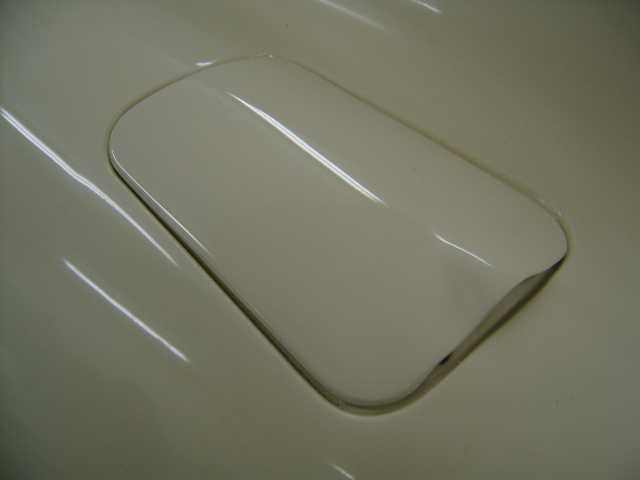 In the last installment of my restoration of an E-type, I had completed the application of the final paint on the bodyshell. I then discussed the process of buffing and polishing the paint finish to give it a show car look. One risk of performing all of the body work, including final paint, is that now I will have to be extra careful to not damage the paint as I continue work from here. Sure enough, the careless opening of the door of an adjacent car in my shop space served to drive that point home as a “door ding” appeared. Fortunately, having an understanding of how the paint finish was applied, I was able to perform a little more buffing and polishing and found that the blemish came out. Whew! One simple precaution that I have taken is to apply masking tape to the edge of the doors, to give them a little bit of extra protection for now. With the body painted, I could get started “hanging things on”. The aforementioned doors were hung on their previously re-furbished hinges. I left precise alignment for later, after the rubber seals could be installed and after I had spruced up the door handles, latches, and striker plate. Actually, I may remove the doors when it comes time to install the interior insulation, wiring, and upholstery. I have taken the doors on and off so many times by now one more time won’t hurt. I also loosely installed the rear deck lid, again mainly to get it out of harms way. I will have to remove it again to install the glass and rubber seals. One small but for some reason very satisfying event was the installation of the gas cap filler lid. That installation should be final. After some consideration of where to head next, I decided to tackle the engine frame. As I have previously discussed, the E-Type has a monocouque passenger compartment. Attached to the firewall are left and right hand frames that support the engine. 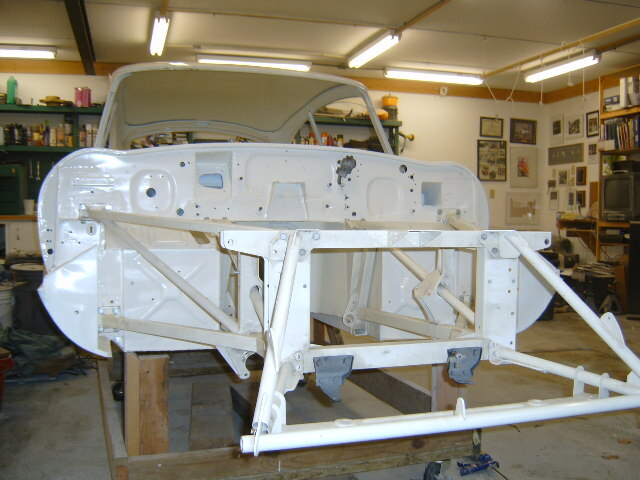 On the front of the frames are additional structures that support the steering rack, front suspension, radiator, and the hood support. The engine frame has 8 attachment points on the firewall. Most of these attachment points have plates with 4 mounting holes. So there are over 30 holes to get lined up! Since my bodywork had disturbed only 2 of the 8 attachment points and I was using the original frames, I was reasonably confident that things would line up. That said, it took several hours and some coercion with pry bars and drift pins to get all the holes lined up and the bolting hardware started. For those locations that involved captive nuts, I had to run a tap through their threads to get the paint out. Eventually I got every bolt installed and snugged into place. At this point, I grabbed my measuring tape and measured the vertical distance from the 4 corners that represented the 2 front and 2 rear suspension attachment points. I was relieved to see that the two rear measurements were the same and the two front measurements were the same. This meant that the frame was not warped or twisted. A little bit of difference can be accommodated by the use of shims but a large difference would have been bad news indeed! After this critical dimensional check, I proceeded to partially loosen the bolts at all of the front frame attachment points. This was so I could inject urethane construction adhesive into the space between the mounting plates and the firewall. I did this for several reasons. The adhesive would help to keep water out of the joint between the two plates. This would prevent corrosion starting in this known trouble spot. It would also keep water from leaking into the cockpit and soaking the carpet. Finally, the urethane remains slightly pliable when cured. This should reduce the transfer of noise and vibration. Fitting the engine frame to the rest of the car is a major event visually, as the car suddenly starts to look complete. I only wish! There are many parts big and small that still need to be added. But for now I’m happy to see the project shaping up into something that at least looks like it will be motoring in the near future, even though experience tells me I have a long way to go!